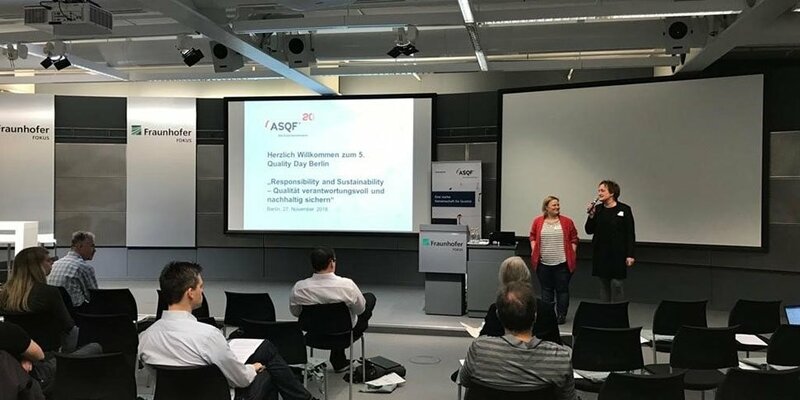 The 5th ASQF Quality Day was held at the Fraunhofer FOKUS on November 27th. Subject of this year’s event was »Responsibility and Sustainability - Ensuring Quality responsibly and sustainably«. The day was opened by Prof. Dr.-Ing. Ina Schieferdecker, Director of the Fraunhofer FOKUS and President of the ASQF e. V.
In times of strong interconnectedness and higher deadline pressure in software delivery, new questions arise for software developers: who is responsible for the software quality? What does sustainability mean in the context of software quality management? And what are the requirements to ensure the quality of the software being developed? These and other questions were discussed intensively at the Quality Day. Participants were able to find out more about these topics in both classic keynotes and new formats, such as a World Café or an interactive fishbowl, and discuss the challenges of good software quality. Numerous speakers presented their ideas on topics such as traceability, quality assurance or sustainability. Marc-Florian Wendland, Senior Scientist at the Fraunhofer FOKUS, gave a lecture on »Sustainable Software Quality through and in Test Automation«. In particular, he spoke about automation in industrial systems which are being tested thoroughly. In contrast, this is not the case with the software used. However, truly sustainable solutions for industrial applications can only be found using test-based approaches.